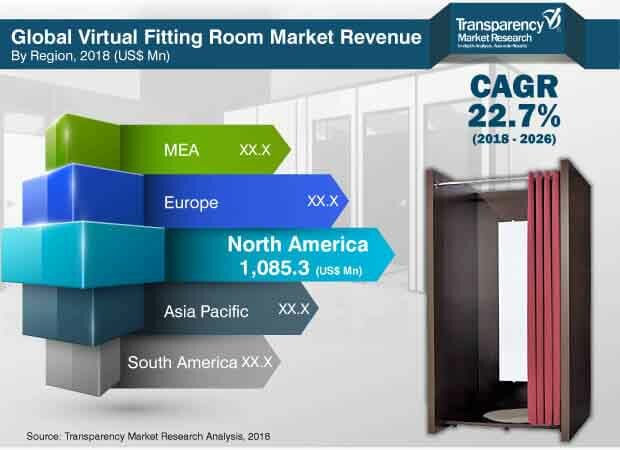 According to a new market report published by Transparency Market Research, the global virtual fitting room market was valued at US$ 2,501.8 Mn in 2016 and is expected to expand at a CAGR 22.7% from 2018 to 2026, reaching US$ 14,869.1 Mn by the end of the forecast period. According to the report, North America was the largest contributor in terms of revenue to the virtual fitting room market in 2017. This is primarily because North America is among the earliest adopters of advanced technologies. Another major trend in North America is the development and adoption of 3D body scanning virtual fitting room which is also anticipated to boost the growth of the market in the region. Rising implementation of advanced solutions to offer better shopping experiences, and growing need to minimize return rates and improve conversion rates are the major factors which are expected to fuel the growth of the virtual fitting room market across the globe. A quickly evolving competitive environment, a seismic shift toward advanced shopping, and the continuously changing opinions of highly informed customers are leading to a new perception in the retail industry. Therefore, retailers are highly focused on providing enhanced shopping experiences to their customers with an aim to broaden their customer base and improve sales. In the retail industry, specifically in online shopping, the return rate of apparel are very high. Most of the clothing ordered online is returned due to wrong fitting. VFR is designed to be computationally efficient, improving the technique of shopping online for new clothes. Furthermore, consumers today are more skeptical, fickle, and distracted than ever, making it impossible for many retailers to hit their retention goals. By adopting virtual fitting room solutions, retailers are able to offer comfort, improve customer retention, and streamline the entire fitting room process, which in turn drives the growth of the virtual fitting room market. Based on geography, the global virtual fitting room market is bifurcated into North America, Asia Pacific, Europe, South America, and Middle East & Africa. Among these regions,North America accounts for the largest share in terms of revenue in the global virtual fitting room market. Major factors supporting this growth are the high penetration of advanced technologies as well as fairly high penetration of Internet-based services. However, Asia Pacific and Europe are also expected to contribute significant market share during the forecast period.Increasing smartphone penetration and online shopping are the crucial factors creating new demand for virtual fitting room solutions across the regions. Major virtual fitting room solution providers have started partnering with other ecosystem players in order to increase their product/service compatibility and thereby increase their market share. Some large technological players have started investing in smaller companies to develop strategic partnerships and harness benefits for the future. The global virtual fitting room market includes different players such as Zugara, Inc., Visualook, Virtusize AB, True Fit Corporation, Total Immersion, Sizebay, Secret Sauce Partners Inc., REACTIVE REALITY GMBH, Metail, Imaginate Technologies, Inc., Fitnect Interactive, Fitle, Fit Analytics, ELSE Corp srl, Dressformer, Coitor IT Tech and 3D-A-PORTER LTD.